Nehalem is the codename for an Intel processor microarchitecture, successor to the Core microarchitecture. The first processor released with the Nehalem architecture is the desktop Core i7, to be released in Q4 2008. Server and mobile Nehalem-based processors will follow in 2009 and 2010. Initial Nehalem processors use the same 45 nm manufacturing methods as Penryn. 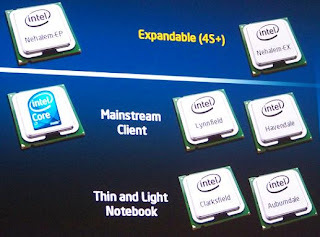 A working system with two Nehalem processors was shown at Intel Developer Forum Fall 2007, and a large number of Nehalem systems were shown at Computex in June 2008. The architecture is named after the Nehalem River in Northwest Oregon, which is in turn named after the Nehalem Native American tribe in Oregon.